Providing for the practical and spiritual needs of hungry, homeless and hurting. Sunday Breakfast Rescue Mission offers a variety of programs and services to accomplish our mission of providing for the practical and spiritual needs of hungry, homeless, and hurting individuals in the Philadelphia area. It is our desire to meet the immediate needs of our guests and to create an environment which inspires real life changes that lead to restoration and rehabilitation. Since its founding in 1878, meals have been an essential service provided by the Mission to the disadvantaged men, women, and children in Philadelphia. Sunday Breakfast Rescue Mission provides three meals a day every single day of the year to anyone in need. 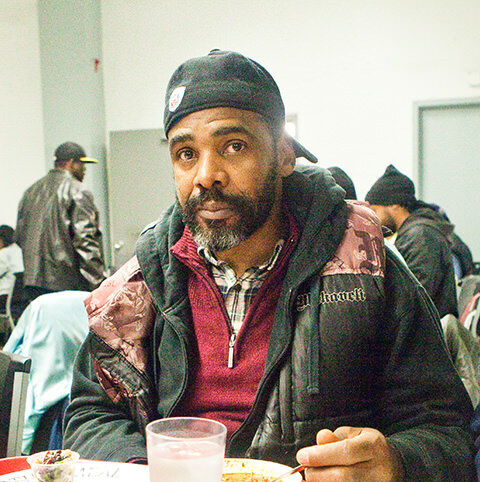 The Mission serves the most indoor meals to the homeless than any other program in Center City Philadelphia. In addition to serving meals, the Mission provides emergency homeless shelter services to men in our community. Sunday Breakfast provides 200 beds to those in need, and is equipped with additional cots when numbers swell due to extreme weather conditions. The Mission also offers a host of health clinics. On Mondays, a nurse from Public Health Management Corporation spends a day caring for the homeless. Every week Medical students from Thomas Jefferson University host a comprehensive medical clinic called JeffHope. A bi-weekly foot clinic is hosted through Best Foot Forward. The Mission also provides weekly HIV testing and Hepatitis testing. The Overcomer Program is the Mission’s 8-12 month men’s recovery program. This Bible based residential program can support up to forty men at a time. This program focuses on total life transformation through the Gospel of Jesus Christ. The Men’s program includes Bible studies, life skills classes, educational classes, and vocational training. Every graduate of the Overcomer Program is on the road to self-sufficiency. The Women’s program at Wayne Hall is located in the Germantown neighborhood in Philadelphia. Wayne Hall is an 9-12 month transitional housing program. This Bible-based residential program focuses on total life transformation through the Gospel of Jesus Christ. Participants attend Bible studies and life skills classes. Every graduate of the Wayne Hall Program is one step closer to living an independent life for her children.